Olive oil is extracted from the olives mostly grown in the region around the Mediterranean sea called Mediterranean basin. I have been using olive oil since last year for Hair care, Skin care and for cooking as well. Olives always remind me of a cartoon character from 90's cartoon "Popeye the sailor man". That was my favorite childhood cartoon show. Okay, here we are talking about olives. This oil has been used by Greeks and Egyptians since ancient times for fulfilling more than one purpose. This liquid gold is one of the healthiest oil in the world and has been widely used for cooking, oiling hair, for healthy skin etc. But can we apply this oil on our face? and what benefits will it provide? Just keep reading this article further to find its amazing benefits. Skip applying chemical loaded winter creams and switch to olive oil. The antioxidant in olive oil helps to repair and prevent damage caused by free radicals, dryness and patchy skin. Olive oil has been used as an ancient beauty treatment . The myth about olive oil is that it causes breakouts which is false. It does not cause breakout if used in moderation. It provides glow to the skin, improves skin elasticity, moisturizes and makes it soft and healthy. Olive oil acts as an amazing makeup remover, It does not only removes foundation but also removes mascara and eyeliner effectively. You can add 1 tsp of aloe vera gel in it and apply it on your face. Massage this mixture with your finger tips for few minutes, wipe the oil with cotton swab and wash off with cold water. Olive oil and aloe vera gel will help to remove all the makeup residue leaving your face moisturized and glowing. Olive oil contains vitamin e and omega 9 fatty acids which penetrates deeply into the skin and improves the skin texture when used over the period of time. Before going to bed take some olive oil onto your palm and gently massage it on your face and leave it for overnight. Within a week you will notice a difference in your skin. You can apply it on other parts of your body too. 1. Benefits of Hot Lemon Water. 2. Top 13 Lemon Benefits for Skin. 3. 18 Home Remedies for Dandruff. 4. Aloe Vera Benefits for Hair an Skin. 5. Aloe Vera Juice Benefits. 6. 15 Health Benefits of Ashwagandha. 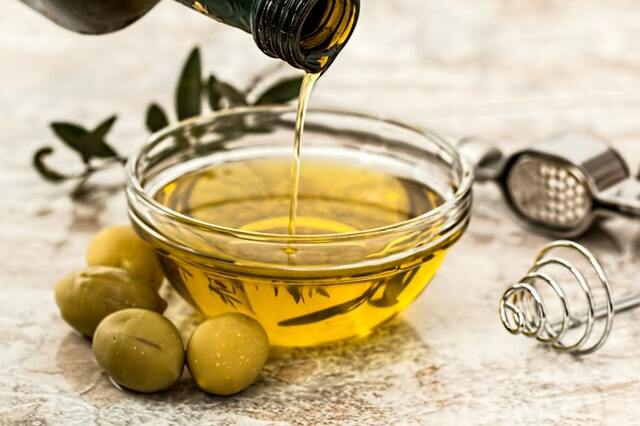 The active component present in olive oil called squalene helps to improve elasticity of the skin and also helps to reduce the appearance of fine lines and wrinkles. I recommend you to use extra virgin olive oil which is suitable for all skin types from dry, sensitive to oily and acne prone skin. Olive oil helps to moisturize and nourish your skin, but it also makes your skin bright and light with regular usage. Mix 1 tsp of lemon juice in 1 tsp of olive oil and apply it on your face. Wash it after 15 mins. You can also make a paste of 1 tbsp chickpea powder (besan), Turmeric and 1 tbsp of olive oil. Apply it on your face and wash after 20 minutes. Do one of these two remedies twice a week for better results. Olive oil is rich in oelic acid and squalene which promotes healing and repairing skin tissues. It is very helpful in healing skin ailments like scars, acne, burns and wounds. Olive oil is soothing, anti-inflammatory, hydrating and non-comedogenic. Mix 1 tsp of baking soda with 1 tsp of olive oil and massage it on your acne with finger tips for 2 mins and than wash it with cold water. Do this remedy every alternate day till your acne is vanished. Apply aloe vera gel with olive oil on burns and wounds it will help in fast recovery. Olive oil contains essential components like polyphenol, vitamin e, squalene and oelic acid which helps to prevent premature ageing of skin. If applied on regular basis on face it helps to smooth out fine lines, wrinkles and protects your skin from harmful UV rays of the sun. Every morning massage olive oil gently with finger tips around your eyes, mouth and forehead. You will notice visible results within few days of usage. Omega 9 fatty acid in olive oil helps to replenish and nourish your skin. Mix required amount of sugar, 1 tsp of lemon juice (optional) with olive oil in a bowl and exfoliate your body with this amazing scrub. Exfoliate your skin with it once a week and get rid of all dead skin cells, whiteheads and blackheads. You can use it as a lip scrub too. It does not clog pores, retains moisture, makes your skin soft, supple and radiant. These were the amazing benefits of olive oil for your beautiful skin.Thanks for reading this article till the end.